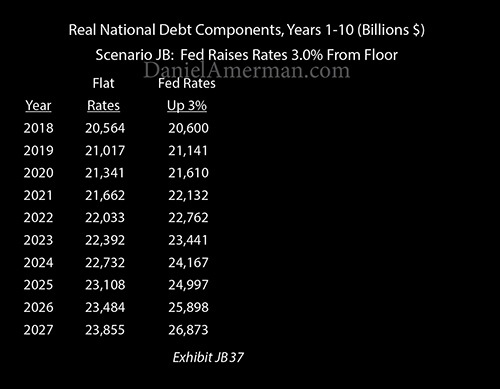 The United States national debt is currently about $20 trillion, and the federal government is paying some of the lowest interest rates in history on that debt. The Federal Reserve has raised interest rates five times now and is publicly considering another seven increases between 2018 and 2020, for a total increase of 3%. What will be the impact on the national debt and deficits if the interest payments on the debt jump upwards because of the actions of the Fed? 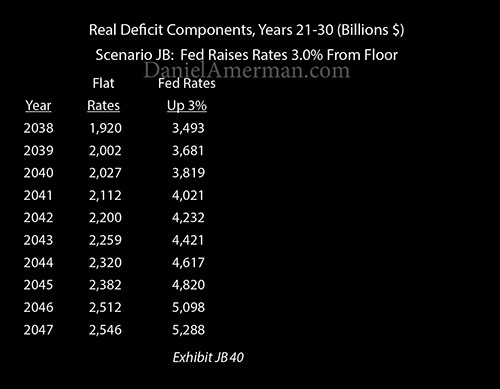 As shown in the graphic above and as will be developed in this analysis, the Federal Reserve increasing interest rates will have a building and eventually explosive impact on the annual deficits that are run by the federal government. The blue area shows what annual deficits would be if the Fed were not raising interest rates, and even in inflation-adjusted terms, those would eventually climbing to over $2 trillion a year anyway, primarily as a result of increasing Social Security and Medicare costs. The yellow area is the increases in deficits that occur solely as a result of the increases in interest rates. As can be seen, the initial impact is small, but the damage quickly escalates. Near $2 trillion-a-year deficits are now reached in ten years, and then rapidly increase to over $3 trillion, then over $4 trillion, then over $5 trillion a year by 2046. In later years, this is more than twice what the deficits would be without the rate increases. The increase in deficits sends the national debt soaring upwards - even as the interest rates paid on those larger debts are higher than they otherwise would be. 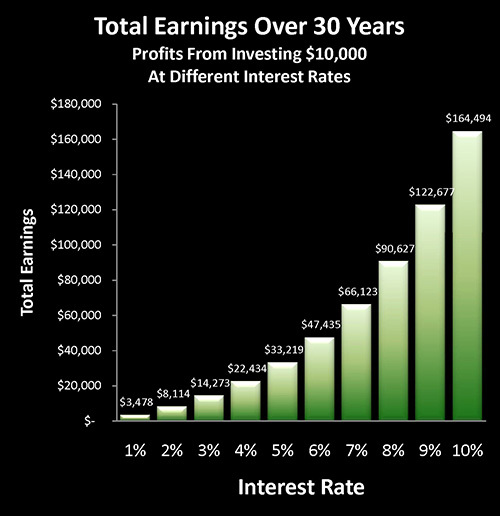 This then creates a compound interest problem for the United States government. 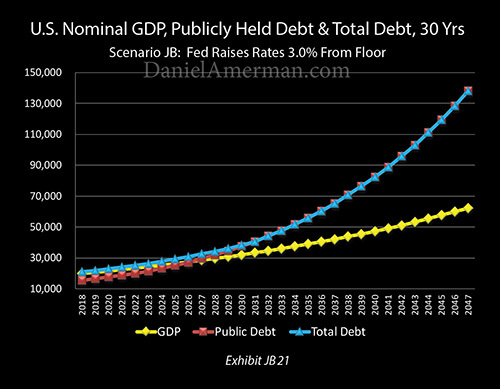 As analyzed herein, the Fed increasing interest rates by itself could increase the national debt by an additional $54 trillion in thirty years (in nominal dollars). A nation that is $20 trillion in debt has fundamental constraints when it comes to interest rates that would not exist at lower debt levels. These constraints are likely to have a powerful influence on future yields and prices in all the major investment categories, including stocks, bonds, real estate and precious metals. As shown above, effective Federal Funds rates were reduced to the lowest levels in modern financial history in the midst of the financial crisis of 2008. After remaining at record lows for seven years, with targeted rates of 0.0% to 0.25%, there have been five increases of 0.25% each between December of 2015 and December of 2017. This has brought the current target for overnight rates to between 1.25% and 1.50%. The Fed is currently discussing raising rates three more times in 2018, by another 0.25% each. The amount and timing of such increases are never certain in advance, but it is also discussing two more increases in like amounts in 2019, and another two increases in 2020. If this or something like it happens, then there will be a total rate increase of 3% between the end of 2015 and the year 2020. In this analysis, we will use two scenarios to examine how the Federal Reserve interest rate increases could increase future federal government deficits and the level of the national debt. For the base scenario "JA", we will leave the average interest rate paid on the national debt at its current level of about 2.25%. For scenario "JB", we will increase rates by 3%, up to a total average rate of 5.25%. For this exploration, we will use a macroeconomic model which integrates the United States economy and national debt with the expected future costs of Social Security, Medicare, and Medicaid. It allows the holistic modeling of various combinations of 1) interest rates, 2) inflation, 3) benefit indexing, 4) economic growth, 5) tax rates and 6) general governmental spending, and shows the implications for the nation as a whole. As described in the methodology notes linked here, the core of the macroeconomic model has been "reverse engineered" from the Congressional Budget Office Long-Term Outlook (CBO LTO). It is simpler than that model, but captures the key components - and most importantly their interaction - in a way which allows for holistic scenario modeling. 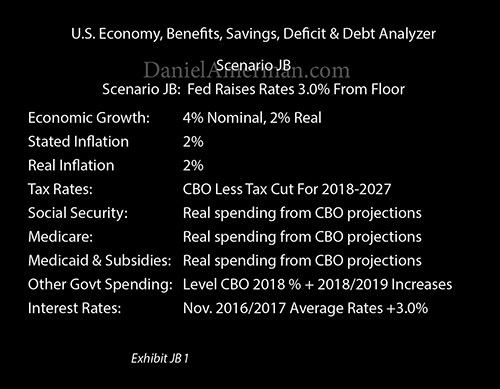 As shown above, the assumptions include 2% real growth, 2% inflation, payment of Social Security and Medicare benefits in full, and a 3% increase in interest rates. The 2018 tax cut and the spending increases in 2018 and 2019 are fully incorporated, as discussed in the methodology notes. The initial impact of increasing rates is quite small, with increases in the deficit of "only" $36 billion and $89 billion in 2018 and 2019. In understanding how the Fed increasing interest rates impact the budget, it is critical to keep in mind that the national debt has short-term, medium-term, and long-term components, with a weighted average life of about 5.8 years. So rate increases by the Fed initially fully impact only short-term borrowing, and then slowly increase the average interest rate paid by the government as medium-term and long-term bonds gradually mature and are rolled over at the new and higher interest rates. This analysis uses a simplified term structure for the federal debt, with an average life of 5.5 years, and assumes that all rates move together. By 2021, the pace is picking up, and the annual cost to the government and taxpayers of the Fed's increasing interest rates is up to $200 billion per year. Just two years later, that cost is up to over $300 billion per year. By 2026 the increase in deficits that is occurring solely as a result of the increase in interest rates reaches a level of over half a trillion per year. Part of this increase is ever more of the national debt being rolled over into new and higher interest rate obligations, but there is another critically important issue. The deficits shown are based on "Net Interest" payments, and those represent interest payments on publicly held debt only. Because interest payments on the Social Security and other Trust Funds are expenses for one part of the government (the Treasury) and income for another part of the government (such as the Social Security Administration), for the government as a whole the income offsets the expense, and the interest payments are netted out in the CBO LTO as well as within this model. However, as the Trust Funds are spent down, the cash to pay the retirees is obtained by selling new external debt, which requires real interest payments in full, and sends the deficits soaring. Few people have thought it through, but as discussed in the methodology notes, the redemptions of the Trust Funds will by themselves create a major increase in annual deficits because of the new net interest payments, and these deficits are greatly exacerbated by the Fed increasing interest rates. The impact on annual deficits in the first ten years can be seen visually in the graphic above. The blue area represents annual deficits if the Federal Reserve left interest rates unchanged at their floor. There is a short-term bump from the $296 billion two year increase in spending, and then in the 2020s deficits would have been rising anyway, due to the increasing costs of paying for Social Security and Medicare as ever more Boomers retire. 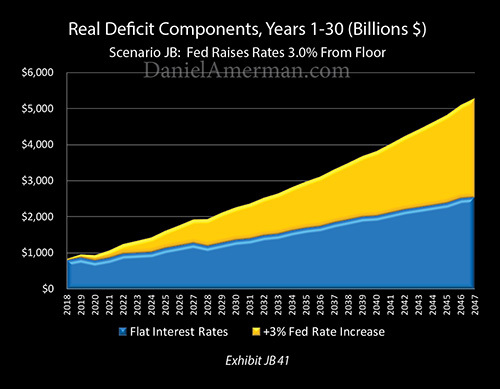 The yellow area is the deficits that occur solely as a result of the Fed increasing interest rates. It starts small, but even within the first ten years, there is a rapid acceleration in annual federal deficits. Because the national debt starts so high and initial deficit changes are small, there is little apparent difference in the national debt in the first few years. Nonetheless - the real increase in the national debt within 10 years is still almost twice as much with the Fed following a deliberate policy of increasing interest rates. The increases in the inflation-adjusted national debt are hard to see in the first few years. But they are becoming boldly apparent by the mid-2020s, as the Federal Reserve interest rate increases visually accelerate the growth in the total national debt. What this shows is that the Federal Reserve has a great deal of latitude to move rates around in a moderate range over the next several years, without having any major initial impact on annual deficits or the size of the national debt. The interest paid on the national debt does not prevent the Fed from raising interest rates in 2018, 2019 and 2020 - so long as we restrict ourselves to the short term. 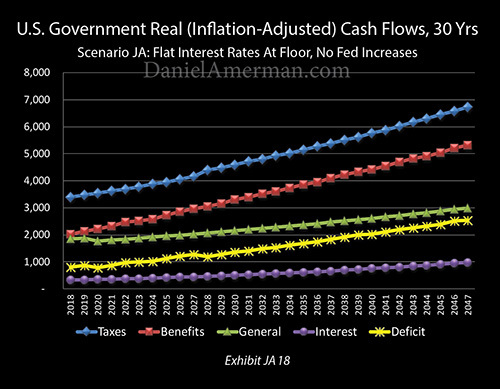 To see cash flows and deficits over 30 years, we will start with a more detailed look at the flat rate scenario, again on a real or inflation-adjusted basis. The blue line is tax revenues from a growing economy, and the impact of the 2018 tax cut can be seen as a slight depression in that line for the first ten years. The red line is the "elephant in the living room", with inflation-adjusted spending on the benefits of Social Security, Medicare and Medicaid growing from just over $2 trillion per year in 2018 to over $3 trillion per year in 2028, to over $4 trillion annually in 2037, to over $5 trillion per year by 2045. The green line is general government spending, which includes everything but benefits and interest payments on the debt. A slight kink can be seen in the first 2 years as a result of the $296 billion boost in spending, and then spending grows at a much slower rate than benefits, which again illuminates why the future will be so different from the past. The purple line is net interest payments on the national debt - and it is climbing with time both because the debt is growing, and because an ever greater percentage of the debt is becoming publicly held debt, where real interest has to be paid instead of being netted out on the interest payments to the Trust Funds. The critical line is the yellow line of annual deficits, which we get by starting with the blue line of taxes and then subtracting the red, green and purple lines of the three categories of government spending. The "kinks" in the blue and green lines from the tax cut and spending surge can be seen directly changing the shape of the yellow line of deficits. Something important to note is the slope of the yellow deficit line over time. It is not only rising, but it is pulling away from the purple line of interest payments on the debt. What that tells us is that increasing interest payments are driving deficits upwards, but they aren't the main reason. 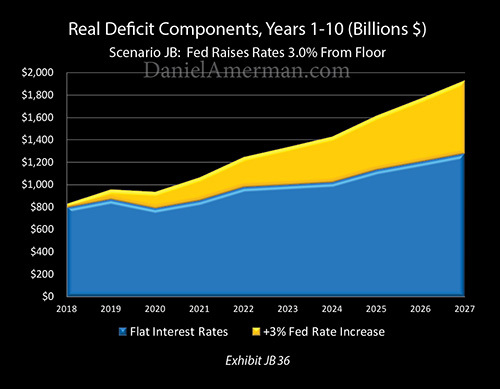 With flat interest rates, it is the red line of future benefit spending that is pulling up the yellow line of deficits and is the main driver of the increases in deficits and the national debt. When we look at the impact of the Fed increasing interest rates by a total of 3% from the floor, we see some dramatic differences. The blue, red and green lines are unchanged, with taxes, benefits and general government spending remaining the same. However, the purple line of interest payments now soars upwards at a much faster pace, solely as the result of the Fed's planned actions. As the existing debt rolls over and is replaced by much more expensive new debt, this sends the yellow line of deficits upwards at a sharply faster rate. The extraordinary place where annual deficits almost equal total general governmental spending - everything but benefits and interest payments - is now reached in ten years. As we reach the place where the debt has rolled over and the Trust Funds have been spent, then we can see something truly important - even in inflation-adjusted terms, the interest on the national debt is accelerating upwards, there is a distinct upward bend in the purple line. The Federal Reserve increasing interest rates will eventually create a compound interest problem, where the interest on the money borrowed to make higher interest payments accelerates the growth in the deficits, which accelerates the growth in the national debt, which further accelerates the borrowing needed to make the interest payments on the debt. Paying ever more trillions in promised Social Security and Medicare benefits is a major financial issue for the federal government. Paying substantially higher interest rates on a starting $20 trillion national debt ($14.7 trillion publicly held), and having that create a compound interest problem - is also a major financial issue. What is far, far worse than either of these major problems in isolation is what happens when we take a holistic perspective and combine the two problems. The real world of deficits, debts, and interest rates is, of course, holistic so this is the only way to see and understand reality. Hence, the use of the macroeconomic model to put everything together. Even without the increase in interest rates - the red line of paying for Social Security, Medicare and Medicaid were already pulling deficits up to ever more dangerous levels. The impact of increasing interest rates whereby compound interest feeds off the increase in benefits becomes like throwing gasoline on a fire that already existed. The sole difference between the two scenarios is the Fed increasing interest rates. We start with a steadily building fire, which is the red line of benefit spending. The purple line is the interest paid not just on the starting national debt, but the new deficits and debts needed to finance the fast-rising benefit payments. And when the Fed materially raises interest rates, it is like throwing gasoline on the fire. Each year, what the fast-climbing yellow line of deficits shows is ever more gasoline is thrown on the fire, due to the increase in benefits, the increase in deficits and the increase in the debt upon which interest must be paid. In nominal terms (not including inflation), deficits reach about $1 trillion per year by 2019, $2.1 trillion per year by 2026, $3.1 trillion by 2031, $4.3 trillion by 2035, $5.3 trillion by 2038, $6.0 trillion by 2040, $7.4 trillion by 2043, $8.4 trillion by 2045, and $9.4 trillion per year by 2047. The fantastic destination as the fire grows larger each year, and then ever more gasoline is thrown on it each year, is a rate of increase in the deficits of about half a trillion dollars each year. That is what is ultimately created by the Federal Reserve increasing interest rates for a nation that is $20 trillion in debt and that already has a solvency problem with paying for future retirement promises. Until, there is an eventual financial explosion - or something changes. Such as the interest rates on the debt, or the number of benefits actually paid out. Using the macroeconomic model, we can identify how much of that surge in the deficits is built in with the increase in benefits, and how much is the increase in interest rates. The acceleration introduced by the increase in interest rates can be clearly seen when we compare the inflation-adjusted deficits for years 11-20. With flat interest rates, annual deficits increase by $646 billion over those years, which is bad enough and is primarily based on increases in benefits. With the Fed increasing interest rates, annual deficits increase by over $1.3 trillion, which is a dramatic acceleration as higher interest costs and compound interest feed the increase that was already being caused by benefit increases. The contrast in inflation-adjusted deficits in years 21-30 is even more dramatic. Yes, even without an interest rate increase, annual deficits would increase from $1.9 trillion to over $2.5 trillion, which is an increase of $626 billion per year. All three numbers are staggering. However, the $626 billion increase between 2038 and 2047 is actually slightly less than the $646 billion increase from 2028 to 2037. So if the heart of the problem is restricted to "just" a fantastic amount of benefit increases feeding into a starting very large national debt, there is just a bit of deceleration going, things are getting worse at a slowing rate instead of an increasing rate. When we add in the potential Federal Reserve interest rate increases, however, then the annual deficit climbs from a starting $3.5 trillion to an ending $5.3 trillion. That is an increase of about $1.8 trillion, which means the 3% increase in interest rates is creating annual deficits that climb at almost 3X the speed that they otherwise would. When one adds higher interest rates and compound interest to the existing problem of a fantastic amount of benefit increases that were already feeding into a very large starting national debt - then what was already a major problem becomes something far more dangerous. This can be clearly seen visually in the graph above of 30-year inflation-adjusted deficits. It is not just the dramatic increase in deficits that can be seen with the growth of the yellow area that matters. What matters more is that the result of the Fed raising rates creates an increasing slope in the top yellow line while the top of the blue line is not. The compound interest induced surge in deficits becomes clearly visible when we move to the national debt in the years 2028 to 2037. The inflation-adjusted increase in the national debt that occurred between 2018 and 2027 was "only" about $3 trillion as a result of the 3% increase in interest rates. When we look at the following ten years - the increase in the national debt as a result of the interest rate increase is in excess of $12 trillion. 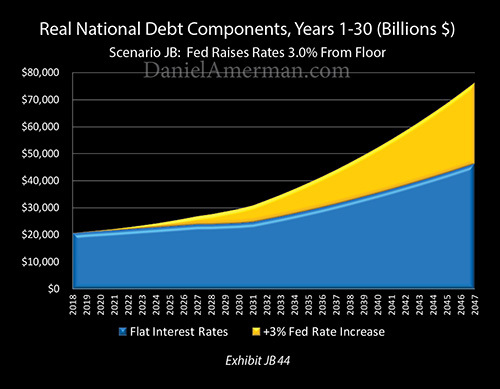 Even with flat rates, the national debt is climbing much faster in the second ten years because of the surge in benefit costs, but when we stack on the compound interest at higher rates there is clearly an exponential increase in the national debt that is occurring. The impact is even more dramatic when we move to the 2038 to 2047 time period. 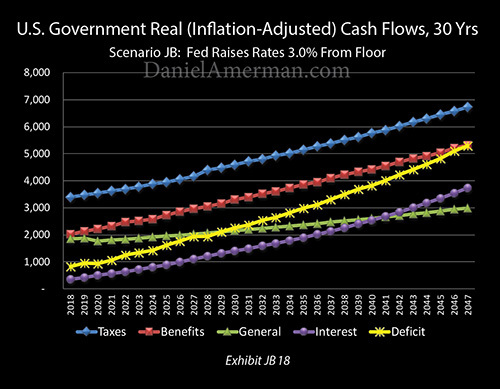 Even in inflation-adjusted terms, the 3% increase in interest rates produces almost a $30 trillion increase in the national debt, for what was already a quite problematic time period. Without higher interest rates, the increase in benefit payments would double the national debt to over $41 trillion by 2044. However, with a 3% increase in interest rates, the national debt would be $76 trillion by 2047, and only about a year away from being 4X what it is right now. The tremendous increase in the national debt - given enough time and compounding - is boldly obvious in the graphic above. What is already a bad problem, gets much, much worse and at an increasing rate. The previous numbers were inflation adjusted, but it is also worth taking a look at this in the same way most of the world views these issues, which is in "nominal" dollars that have not been adjusted for inflation. 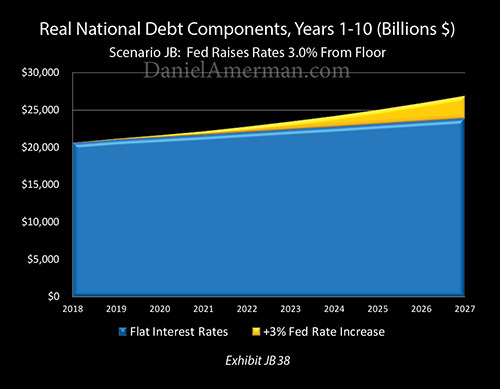 Even with our flat rate scenario, the total national debt still climbs to $29 trillion by 2027, $46 trillion by 2037, and almost $84 trillion by 2047. With a 3% interest rate increase and no discount for inflation, the acceleration in the national debt is boldly obvious above. The total national debt is now up to over $32 trillion by 2027, over $65 trillion by 2037, and is up to the fantastic sum of about $138 trillion by 2047. If we keep taxes, benefits and general government spending at identical levels, and the only change is the Federal Reserve raising interest rates above their floor by a total of 3% as discussed, that by itself is enough to increase the size of the national debt by $54 trillion. This analysis is not intended to be a forecast, nor is it intended to project inevitable gloom, doom, and financial crisis. Oh, something like this could certainly happen. Financial history is replete with crises, it is never a question of "if" but more like "how often" and "how bad". The Fed could stick to its old model for interest rate increases from days gone by when the debt was far smaller and Social Security and Medicare were far more affordable. By doing so, they could indeed create an extraordinary financial crisis in the future. The main purpose of this analysis was not, however, to predict such a crisis. The purpose was to provide useful financial information through the identification of constraints which currently exist, that did not exist in the past. 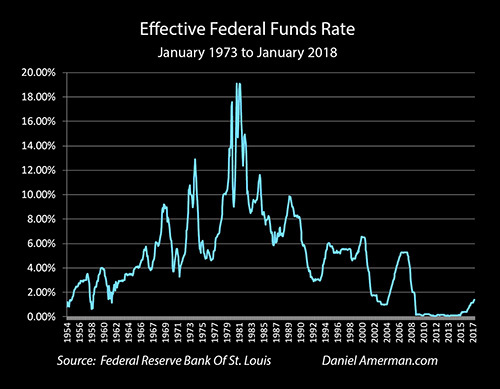 The financial media is full of discussions of Federal Reserve interest rate cycles as they existed in the past, with the implication that we can do the same thing in the future. As explored herein, that can work for a few years. But at some point, either the rates need to come back down again, or there will be a crisis, or something else needs to happen to prevent that crisis. 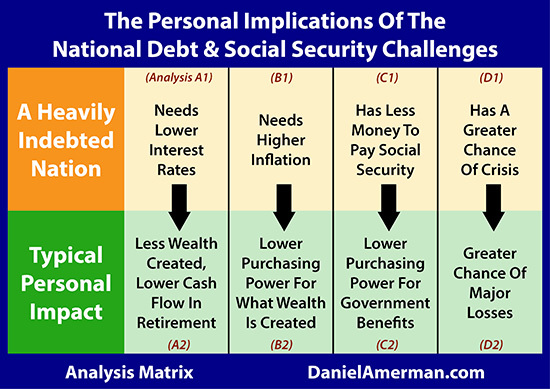 As shown in the analysis matrix above which is linked here, a heavily indebted nation such as the United States has multiple constraints. It needs lower interest rates, and/or higher rates of inflation, and/or lower purchasing power for retirement benefits - or if those constraints are not followed, then there is a greater chance of a future major crisis. Each one of these possibilities of low-interest rates, higher inflation, lower benefit purchasing power, or future major crisis, has the potential to transform any of the major investment markets, as well as standards of living in retirement for the nation. Over the short term of the next 1-3 years, the weighted average life of the national debt does indeed allow the Federal Reserve a great deal of latitude when it comes to raising interest rates. This is because most of the national debt is not initially impacted. Within 5-10 years, however, maintaining higher interest rates comes at a very high cost as ever more debt rolls over at the new interest rates, and this would have the effect of doubling the interest payments on the debt, while drastically increasing the size of the annual deficits. When we go to the longer term of 15-20 years and beyond, the Fed's stated plans would create a financial catastrophe scenario, because of the higher compounding rate of 5.25% versus 2.25%. When we look at future stock prices, or bond prices, or real estate prices - interest rates will be of crucial importance. The timing aspects identified in this analysis have critical implications for the price paths that are likely to be traveled by all the major asset classes in the short and medium term. Over the longer term, we know that the United States government has an existential interest in keeping rates low for many years to come. Which means that the future is indeed likely to be different from the past when it comes to price and yield performance across all the major investment categories. When it comes to individuals, there is likely no group that will be more impacted by the increase in the national debt than current and future retirees and retirement investors. This is true when it comes to the value of retirement investments as well as the levels of retirement benefits. The reliable compounding of investment income is the mathematical core which traditional financial planning for retirement is predicated upon. Yet, as explored in detail in the analysis linked here, the doubling of the national debt created a profound conflict of interest between the government and the interests of retirement savers. The very yields that are traditionally assumed to be available to reliably create wealth for retirement investors - also financially cripple the US government. And the suppression of yields that preserves the financial viability of the government - financially cripples many retirement investment strategies. When the national debt did rapidly double, even as the largest generation in US history neared retirement - the future changed for the nation. What is realistic to expect for retirement investment income changed. What is realistic to expect for Social Security and Medicare benefits changed. And those who wish to be realistic with their personal plans can either adjust for the changes - or they may be facing a long series of "surprises" that could change their day to day quality of life for years or even decades to come. This analysis is part of a series, an overview of the rest of the series is linked here.